Maya, fresh from high school, is recruited by the CIA soon after 9/11. She is stationed in Pakistan and assigned the task of following every lead related to Bin Laden. Station chiefs come and go and so do terrorists attacks abroad as well as the US political administration. After ten years, when most of her colleagues have given up on Bin Laden’s capture, Maya catches a break due to a human error from long ago that is discovered by an ambitious new recruit in Pakistan. The lead is a man suspected of being Bin Laden’s carrier, and by following him the CIA stumbles upon the most wanted man in the world who has been hiding in a secure compound in Abotabad, Pakistan. When the credits rolled all I said was wow! 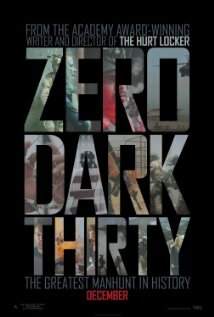 Zero Dark Thirty has a magnificent script and is skillfully directed by Kathryn Bigelow, the award-winning director of The Hurt Locker. It is a taut, edge-of-your-seat thriller that doesn’t shy away from the torture carried out all over post 9/11. Thanks to those scenes Zero Dark Thirty has stirred controversy for some US senators claim that practices such as water boarding and sleep deprivation didn’t lead to the finding and subsequent execution of Bin Laden. It is irrelevant whether that was the case, after all, it is a movie and we don’t go to the movies to set the facts straight but to enjoy the telling of a good story and Zero Dark Thirty is a darn good one. Jessica Chastain is fantastic in the leading role as Maya. Though in 2012 there were few women in leading roles to be measured against, Chastain’s performance is Oscar-worthy. In Zero Dark Thirty, Chastain reprises the role of a clandestine agent that she interpreted in The Debt, but if in The Debt she was a woman torn between a man she was attracted to and another she loved, meanwhile fulfilling her duties as an intelligence agent, in Zero Dark Thirty she is a woman determined, obsessed even, with finding the man responsible for the 9/11 attacks on American soil. She was brilliant in both of the aforementioned performances but it may be for Zero Dark Thirty that she wins the coveted Oscar for Best Actress. Kyle Chandler co-stars as Joseph Bradley, CIA station chief in Pakistan, in another great movie after Super 8 and Argo. Joel Edgerton and James Gandolfini also co-star. I confess I’m now torn between Argo and Zero Dark Thirty as the best picture of 2012; ironically neither got nominated in the Best Director category for 2012 Oscars, too bad because all the other films come in a far second place.